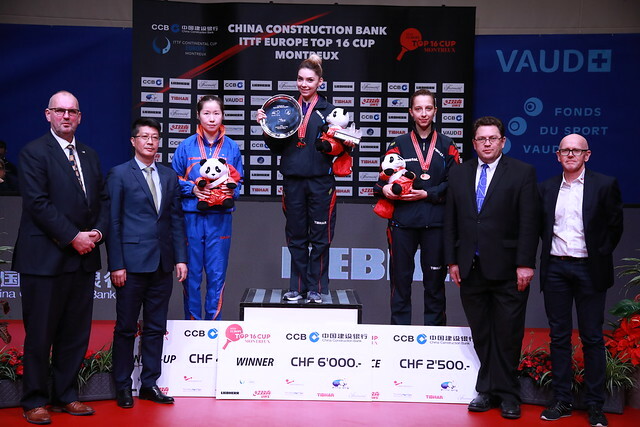 Montreux will welcome the continent’s strongest table tennis stars in just under a month’s time with the China Construction Bank 2018 ITTF Europe Top 16 Cup taking place in the Swiss town from Saturday 3rd to Sunday 4th February and one player who is hoping to impress at the event is the host nation’s Rachel Moret. Unlike last year’s competition the 2018 ITTF Europe Top 16 Cup will be contested across two days beginning with Round of 16 knockout action, meaning that 16th seed Rachel Moret will have to be at her best right from the start of play. “Looking at my starting number and the game system, a direct knockout format, it could be difficult.” Rachel Moret. Many of Europe’s elite players will travel to Switzerland for the tournament including defending Women’s Singles champion Li Jie, Elizabeta Samara and Petrissa Solja. Occupying the lowest seeding position in the Women’s Singles draw Rachel Moret heads into the 2018 ITTF Europe Top 16 Cup competition with the odds stacked against her but the Swiss representative is not to be underestimated, especially with the backing of the home crowd. “I do not usually play against these players. It will be a real test for me to reach my best level against the best European players. Why shouldn’t I cause an upset? At home that would be great!” Rachel Moret. Rachel Moret also has one eye on the Tokyo 2020 Olympic Games and what better way to kick-start her qualifying efforts than with a strong outing at the upcoming 2018 ITTF Europe Top 16 Cup? “I have to win as many matches as possible to reach the 2020 Olympic Games. The Top 16 will allow me to gain experience and confidence.” Rachel Moret. Buy tickets for the China Construction Bank 2018 ITTF Europe Top 16 Cup here.